Please note that this page contains "educational" computer software games. 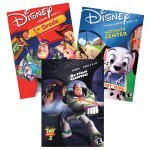 If you are looking for more "action-packed" Disney computer games on CD-ROM, go to the Disney Computer Games Page. Platform: Don't miss this fun, underwater learning adventure for ages two to five. 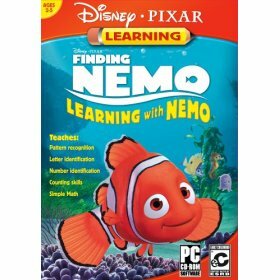 In this game, it's Nemo's first day of school and you must help him and Dory collect pictures of sea creatures and objects for an exciting scavenger hunt. Along the way, players will encounter games like Pearl's Garden Eel Bingo, Knock 'Em Down Nemo, Turtle Hopping at the EAC, and finally All Aboard! for a ride back to the coral reef. Throughout the game, players have the opportunity to take pictures of collectibles and add them to an album, Undersea Sticker Fun, which can be personalized in multiple ways. The game features three playing options: Adventure mode, which starts the player on the Scavenger Hunt Adventure Story, Game mode, which takes the player directly to the four mini-games, and Undersea Sticker Fun, which lets the player view gathered collectibles. Platform: Learn and laugh with Pooh and Mickey! 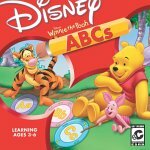 Disney Learning Toddler featuring Mickey Mouse and Winnie-the-Pooh is an early learning tool that enables children ages 18 months to 3 years to learn age-appropriate skills with their favorite Disney characters. Also included Playhouse Disney's The Book of Pooh: A Story Without a Tail. 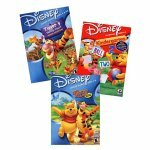 This great product allows children to relive one of their favorite Playhouse Disney television shows by allowing them to immerse themselves in the unique puppet world of Winnie-the-Pooh and friends! Just like the television show, children will set off on an exploratory journey through the familiar Hundred Acre Woods via animated transitions through "pages of the book!" Along the way, children will be exposed to preliteracy skills emphasizing the love of reading, as well as caring, sharing, playing, and exploring. Platform: "P" is for "Pooh," and preschoolers, too! Kids join Winnie the Pooh and friends in the Hundred Acre Wood to learn their letters. Disney's "Winnie the Pooh: ABCs features age-appropriate activities focused on the ABCs. Kids can cook alphabet soup in Kanga's kitchen as they master their letters and much more. Winnie the Pooh: ABCs stimulates preschoolers' imaginations, builds self-confidence, and develops valuable social skills. Plus, kids will love charting their progress on the printable tree house. 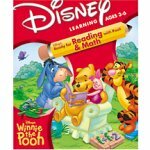 Platform: Adapted from Ready for Math with Pooh educational CD-ROM, Disney's Winnie the Pooh: 123s helps kids, ages 3 to 6, polish their number knowledge in the confidence-building environment of the Hundred Acre Wood, with encouragement from Pooh and pals. Platform: Adapted from Ready to Read with Pooh educational CD-ROM, Disney's Winnie the Pooh: Spelling helps kids, ages 3 to 6, polish their spelling skills in the confidence-building environment of the Hundred Acre Wood, with encouragement from Pooh and pals. Platform: Winnie the Pooh and the other denizens of the 100 Acre Wood are ideal companions for guiding your baby through his or her first software experience. Their gentle silliness and not particularly linear behavior provide a perfect match for the vagaries of baby reasoning. Babies can help Pooh pull everything from bubbles to birds out of his honey pots. Use spoons to bang out rhythms on pans with Baby Roo. Point to body parts with Piglet. Paint with Eeyore, who glumly uses his tail as a brush. ("Green. Like the grass. Except when it's brown. Sigh.") Or play a bouncy game of hide and seek with Tigger. With all five of these elements, your baby can initiate action by simply mashing a key (or five) on the keyboard. Music, colors, opposites, and counting are just a few of the many concepts these activities explore. A couple of smart touches are buttons a parent can click to control the play. A Good Job button causes the character to give positive feedback to your baby. The Do It Again button is for that thing near and dear to all babies' hearts: repetition. It exists so parents can make balloons float out of Pooh's honey pot ad infinitum, which is just how babies likes it. Platform: Disney Learning Toddler featuring Mickey Mouse and Winnie the Pooh is an early-learning tool that enables children to learn age-appropriate skills with their favorite Disney characters. Whether your child is visiting friends in Mickey's neighborhood or exploring the Hundred Acre Wood, they'll learn important skills that enhance memory, observation, and listening. Other exercises will teach them letters, numbers, colors, shapes, and music--all in an atmosphere of gentle encouragement and fun. Platform: You can always count on Disney for great music. The soundtrack for Disney's Mickey Mouse Toddler had my own toddler bopping and dancing before installation was complete. (Yes, music plays while the CD-ROMs are loading. Leave it to Disney to add a touch like that.) After an entertaining installation, Mickey, Minnie, and the whole Disney crew introduce toddlers to shapes, numbers, letters, colors, and music. The gang also entertains constantly in that time-honored Disney style. "Hey! Polky-dots!" declares Goofy as a swipe of the mouse transforms his house from stately blue to spotted circles in a painting/color/cause-and-effect activity where toddlers can remodel Goofy's house. Donald Duck wakes up from his nap, inimitable snore interrupted, and shrieks "Quiet!!!!" while baby creates a cacophony by sweeping the mouse around Donald's musical houseboat (replete with clapping scallops and a piano-key roof). After the racket settles down, a crab sidles out, pincers the radio on, and the fun begins again. Mickey leads a game of peekaboo with letters, Minnie needs help discovering the shapes around her house (check out that tree pruned like a triangle), and Pluto is chasing the gopher that keeps stealing his number-shaped chew toys. Every activity here is freeform, easy for a toddler to activate with either the keyboard (any key--or keys--will do) or a mouse move, and a complete delight. Disney's Mickey Mouse Toddler is a refreshing romp compared to some of those "Baby Must Learn Now, This Is Serious Stuff" offerings out there. (Ages 18 months to 3 years). Platform: Disney Learning Preschool featuring Mickey and Pooh is an early learning tool that enables children ages 2-4 to learn age appropriate skills with their favorite Disney characters. Promotes critical thinking and problem solving while enhancing memory listening, perception, and observation skills. Rich with humor, creativity and music, this deluxe two-CD set fosters self-esteem through positive reinforcement and encouragement. Also includes printable workbook pages and flashcards as well as automatic and adjustable skill levels. Platform: This is a terrific package of toddler software, featuring one disc of Winnie the Pooh Toddler and one disc of Mickey Mouse Toddler. Activities are inherently interesting to children -- colorful, musical problem solving and play -- and generally have three difficulty levels in order to customize the experience. In Winnie the Pooh, each activity (involving letter recognition, sorting, counting, music, sequence completion and painting) occurs in one of the main characters' houses, and children use a navigation screen showing all the houses situated in 100 Acre Wood. As each activity is completed, that character is free to attend Eeyore's birthday party. When all of the activities are completed, your child can attend the party and watch the story ending. This kind of cohesive play is sorely missing from most kids' software. In Mickey Mouse Preschool, the navigation screen is set at a diner and gas station run by Goofy. Activities include music, design, arcade shooting, following directions, opposites and games. Most are car-oriented, which is especially fun to many children. While this game doesn't have an overarching goal like that in the Winnie the Pooh game, it is lively and fun. The two discs make a terrific combination for your 2- to 4-year old. Highly recommended. Platform: You can practically smell the burger grease and freshly hung laundry at this funky little diner that Mickey and Minnie Mouse visit when their gas tank falls below "E." As a banjo plunks out a slow tune in the background, Mickey pulls up a chair and sits outside with Pluto to enjoy the sunshine. No agenda here. Instead of explaining what kids should do next, Mickey scratches Pluto and occasionally glances toward the cursor. This is the CD-ROM equivalent of a deliciously lazy summer day with nothin' urgent to do. Kids play and learn at their own pace, by nosing around and figuring things out. Mosey into the garage. One bay houses a body shop where you can piece together and paint custom hot rods; the other, a tune-up place where a swipe of the cursor creates actual tunes on musical wrenches, tires, and hubcaps. Follow Minnie into the diner, and Daisy Duck dishes up dozens of workbook-style exercises on place mats. Wander into the back yard, and Huey, Dewy, and Louie hand you a hose and tell you which letters, numbers, shapes, or colors to squirt. Help pump gas and learn color mixing, numbers, and how to follow instructions. Get it wrong and a chipper customer intones, "That wasn't quite right, but it'll do," as their car backfires and leaves in a cloud of smoke. Our favorite activity was the Opposites Car: climb into a car, and "mouse" with the turn signals, windshield wipers, and other fun switches preschoolers aren't allowed to touch on Mommy and Daddy's car. It's a clever way to teach opposites, and it's great fun to honk the horn and make Uncle Donald drop his laundry. Preschoolers will explore a supportive learning environment in a roadside pit stop off the highway near Mickey's home. While interacting with Mickey and his friends, kids discover over 20 learning skills. The software is based on the Active Learning Method, which encourages kids to explore, discover, and create while they learn. The product enhances memory, listening, and observation skills as well as inspires creativity and imagination. This Program is a Pooh lovers dream come true! Adults and children alike will love this CD. You start at "the enchanted hill" in the hundred acre woods where you pick a character.Each character will take you to a different activity.You may pop balloons, play who likes to, or even make alphabet soup.There is learning in every corner.We (my daughter and I ) love this program! Platform: Develop age appropriate skills such as memory, listening, perception and observation skills in a fun, creative and music-filled environment. 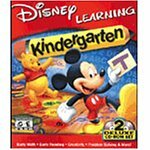 Platform: Disney Learning Kindergarten, featuring Mickey Mouse and Winnie the Pooh, is an early-learning tool that enables children to learn age-appropriate skills with their favorite Disney characters. Whether your child is investigating Main Street for newspaper cover stories with Mickey or attending school in the Hundred Acre Wood, he or she will learn important skills that enhance memory, observation, and listening. Other exercises help young children gain experience with the alphabet, simple arithmetic, and problem solving. Platform: There's a new friend in school: Winnie the Pooh! And he's ready to learn and play with kindergartners in Disney's Winnie the Pooh Kindergarten Plus. This title has been newly enhanced with an introduction to Spanish and French. Through storytelling, games, and activities, children will build fundamental skills in reading, spelling, simple arithmetic, problem solving, and more. Once all the lessons are completed, kindergartners will be rewarded with a diploma and graduation ceremony. Through positive reinforcement and gentle encouragement, Disney's Winnie the Pooh Kindergarten Plus teaches children fundamental learning skills while fueling their creativity and imagination. Platform: The Disney 1st And 2nd Grade Bundle brings the greatest Disney characters to life, as they take your children on amazing learning adventures! Platform: Buzz Lightyear and friends turn Andy's bedroom into a fun and interactive classroom for first graders. Disney's active-learning games and activities promote creative thinking and problem-solving skills, while building self-confidence and teaching more than 40 developmental skills. Perfect for kids ages 5 to 7, Learning 1st Grade will expand your child's learning galaxy. Kids rocket to an adventurous, age-appropriate learning environment of exploration, discovery, and creativity. A two CD-ROM set, Learning 1st Grade is packed with detailed graphics, exciting transitional sequences, and updated educational games designed to support first grade fundamentals, along with a stellar set of print activities featuring Buzz, Andy, and the gang. Platform: Headquarters alert: Zurg forces are trying to take over a peaceful planet. Buzz Lightyear and kids are called into action. It's a long journey, and refueling will be necessary. Buzz's interplanetary ship requires four different fuels, each with its own color. Kids must make sure Buzz's fuel reserves never run dry, which requires an adventurous journey into Buzz's ship. Along the way, kids have to pass challenges designed to build their second and third grade-level math, reading, and language skills. When fuel is plentiful, kids get to navigate the galaxy and unlock arcade-style games. Friends can play along--that is, until the fuel runs out--then the challenges begin anew. Platform: The Disney Bundle includes Disney's 102 Dalmations Activity Center, Disney/Pixar's Toy Story 2 Activity Center, and Buzz Lightyear 1st Grade. Platform: Mickey and the gang find themselves stranded in a haunted house inhabited by fun-loving and mischievous ghosts. Children ages 5 to 7 can explore and experiment within their environment, figuring out just how this wacky house works. It's a fun place that features experiential activities supported with curriculum-based lessons. Platform: Disney's Phonics Quest challenges kids to enhance and master their phonics skills while taking a magical journey with Mickey and his friends. Using state-of-the-art voice recognition technology, kids will actually be able to speak their answers out loud as they master a variety of phonics-based, multilevel learning activities. Kids will join Mickey on a quest as the Sorcerer's Apprentice to uncover the magic of phonics fun. Mickey's quest begins as he opens the Sorcerer's magic book and loses six of the Sorcerer's belongings. As each challenge is mastered, Mickey regains one of the Sorcerer's belongings so he can eventually return in triumph to the castle. Platform: Disney's Ready for Reading and Math with Pooh brings your child into the whimsical world of the 100 Acre Wood, where Pooh, Tigger, and their friends guide children through challenging activities that stimulate imagination as they teach and reinforce critical skills. Put Pooh's hunny pots in order to build the alphabet or earn fun rewards to build your very own garden. From the alphabet and spelling to counting and sorting, you'll be amazed at how your child will flourish with her best friend Pooh. Features strong focus on reading and math readiness, phonics component, adjustable levels of difficulty, offline activities to extend learning beyond computer (available at Disney Web site) and is correlated to state and national standards. Skills taught include letter recognition and tracing, matching letters and sounds, recognizing upper and lower case letters, creating simple sentences, matching words to pictures, listening comprehension, number recognition, counting and sorting, sequential counting, addition and subtraction, greater than/less than, geometry, and classification. Grade level K-1. Platform: Deep in the heart of the Hundred Acre Wood, learning math is a fun adventure. With Pooh, Tigger, and their friends leading the way, children are guided through seven engaging activities that teach beginning math skills. As kids accomplish each skill, they earn a fun reward they can use to build their very own gardens. Skills include counting, sorting, adding, and subtracting. Three levels of difficulty allow children to learn at their own pace. In Pooh's Pantry, kids practice counting by emptying the baskets in the right order. Piglet's Cupcake Kitchen lets kids decorate Piglet's cupcakes as they come out of the oven: kids frost them, add them up, then choose the jar of sprinkles that matches their total. Other activities include helping Rabbit Roo and Tigger collect bugs for the garden, and visiting the Wishing Well, where number matching makes wishes come true. Platform: Your child will be whisked away to learning adventures that build essential reading skills and challenge the imagination. Genie, Jasmine, Iago, and the gang are here to cheer kids on with encouragement and helpful hints. Watch them improve their skill levels as they journey to free Aladdin. 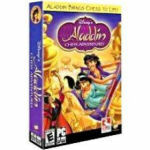 Platform: Math skills come in handy when playing this mystical, mathematical Aladdin adventure. By solving math problems that test skills ranging from addition and subtraction to patterns, estimation, and logic, children can save the day and rescue Aladdin and his friends from the forces of evil. A wicked genie named Bizarrah has escaped from her lamp and has captured Jasmine, Abu, and Aladdin in Agrabah. Players must do the math to put an end to Bizarrah, once and for all. Movie-quality animation and an astounding number of multilevel, age-appropriate math games make this software a classic. Whether kids are playing the Dungeon Games, Agrabah Games, Magical Carnival Games, or Pyramid Games, they'll love the challenging gameplay and adventure this unique software offers. Platform: P is for Pooh and Preschoolers too! Winnie the Pooh and his friends help preschoolers "think, think, think" as they journey through The Hundred Acre Wood in Disney�s Winnie the Pooh Preschool Plus. This popular title has been newly enhanced and now offers an introduction to Spanish and French foreign languages. It also features fun-filled, age-appropriate activities focused on important skills like sequencing, categorization, and phonics. Preschoolers will cook alphabet soup in Kanga�s kitchen, count vegetables from Rabbit�s garden, visit Pooh�s "Echo Tree" for a lesson in foreign language, and attend a birthday celebration for Eeyore! It�s a fun-filled learning adventure for all! For "non-educational" Computer Programs and Games, go to the Disney Computer Games Page.